"....found out that we have a nice 'old timer' method for predicting the season; the avocados are loaded with flowers. Our wild trees on the farm prompted the remark. The old timers say that when the avocados are is loaded to the gills with flowers, there will be a very active season with many hurricanes. Between this and flipping coins, I go with the Guacamole Forecast...."
We are in a Flood Warning State to the north of Puerto Rico from Mayagüez, to Humacao…. 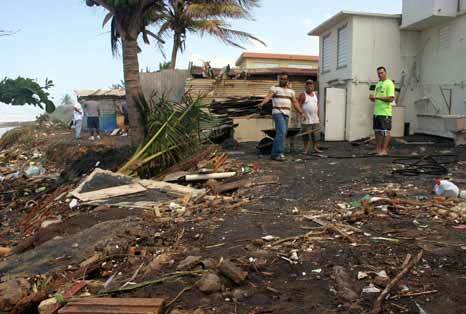 All these Cities are watching the swells, in Carolina (Piñones), the sea come inside the Little Store (Kiosos), that many citizen lost his possessions. Some street like the #187 (that run to Loiza) is disability, and the transportation from Cataño to San Juan Via Sea, Is out of service. 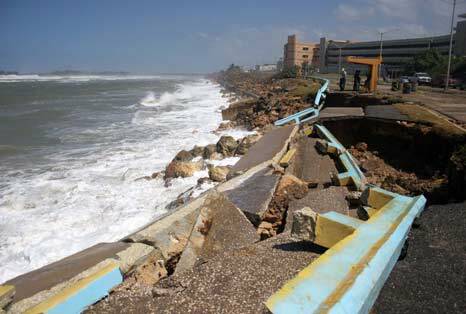 In Arecibo, the sea destroyed part of the Avenue Victor Rojas. Even so, the peoples go to the beach to see, and other to come inside the water. 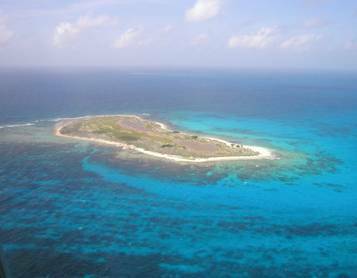 The authorities said, that is very dangerous, visit the bleaches in the north of our island. Now the warning go to Friday, at 12:00pm. OF INCREASED DANGER ALIGNING WITH THE HIGH TIDES. REPORTED ALONG THE COASTAL SECTIONS EXPOSED TO THE NORTHERN swells. Now the winter Storm, is moving to the East , in low motion, the effect of the swells go down, to Sunday the weather will be normal. But we wait a cool from go near out. This is advance like the weather go to change in out planet Earth. The year's hottest artists on the red carpet at the Grammy Awards. AOL Music takes you there. Well, Metro San Juan certainly got pounded with rain today. From my 8th floor window at work, I watched to the north as San Juan disappeared in a huge, blustery downpour. Then, as I boarded the Tren Urbano to head home, the clouds were coming from the other direction and the mountains disappeared from view as rain blew from the south. Even train stations gave warnings to be careful on the platforms as they are slippery from the rain. "Las mujeres y los caballeros: la precaución a causa los pisos mojados, cuando abordar el tren." As we are cleaning up from dinner, I can see some blue sky reappearing. It's been a few days since we've seen that. The strange thing about all of this, we are all experiencing what feels like COLD WEATHER to us. Jackets, and hats outdoors. Blankets and warm socks indoors!! No wonder! It's only 76 degrees!! I'm sure Olga will bring lots or moisture to our neighbors, too. - invest 94 or Olga? Only Nature Knows for SURE! 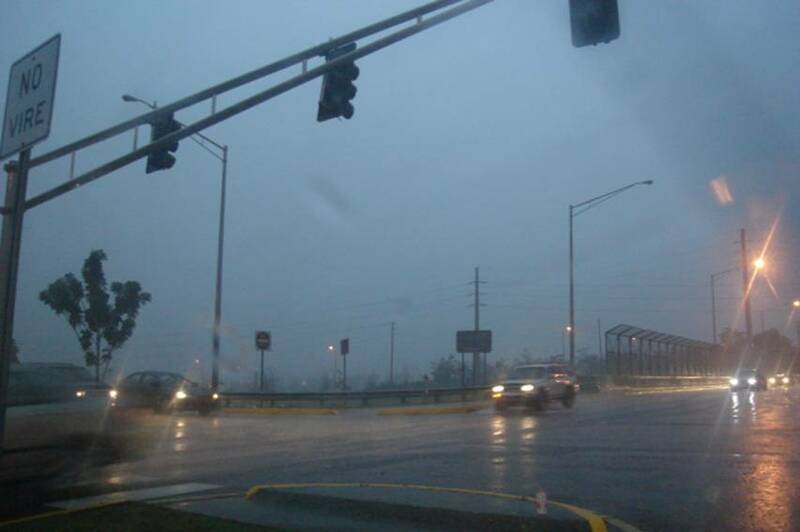 HOWEVER, here on the North Shore of Puerto Rico, we're getting pounded with torrential rains and wind. 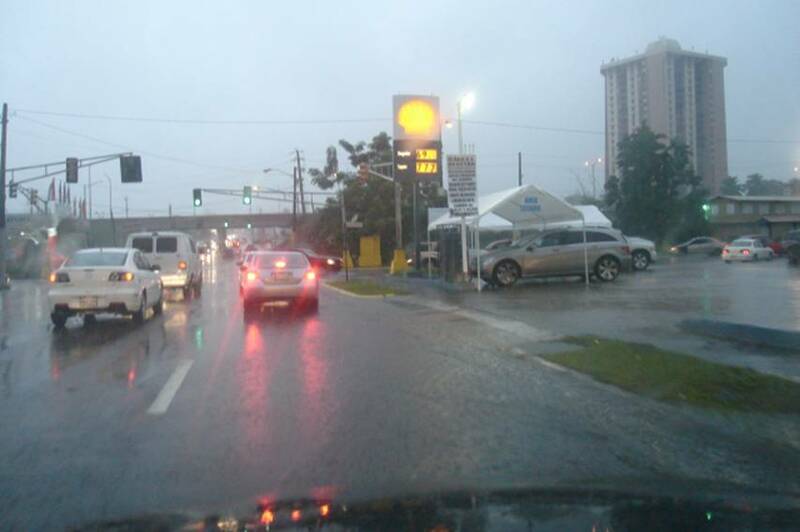 Christmas shoppers are getting a good soaking, and many malls are operating on diesel power as AAE has failed in throughout Bayamón, Cataño, and portions of Toa Baja making driving a bit treacherous. I am soaked from walking to my car in the local mall parking lot. My wind chimes are singing a loud song on the patio and streets are flooding quickly. We usually experience Tropical Rains like this, but it's been a while. I hope my friend is missing this on her Caribbean Cruise this week. I'll find out Friday. Just around 9 pm we have started to experience copious rains here in San Juan. There is wind but nothing extraordinary. No wind howling at all here, unlike what some other folks have reported in the Virgin islands. According to some local weather reporting stations wind gust are at most 10 miles per hour in San Juan (= 16 km/hr). 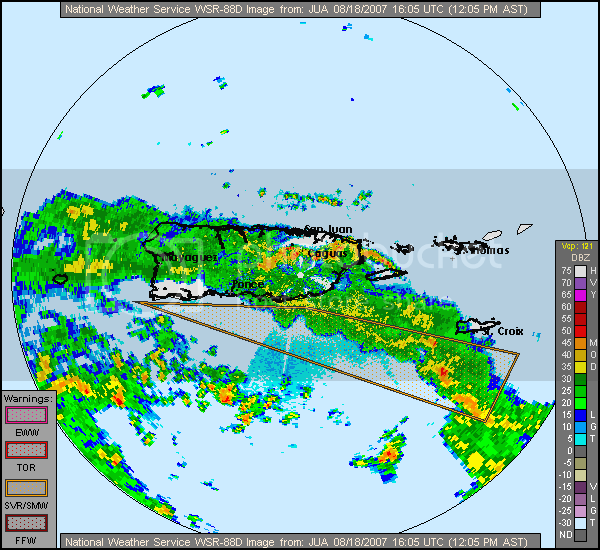 The radar picture shows that the system is developing a round core which is partially over Puerto Rico's north eastern part at this moment. It seems like we will have rain for a while. But doesn't look like like a flooding event. If there is something more interesting I will report later. Good night everyone. Hello! Feeling the storm now, strong winds from the northeast, at about 30 mph or more. Trees are dancing from side to side and the raindrops can be seen almost horizontal carried by the winds. Have seen only one flash of lighting. - Safe to get back in the water? Just as you thought it was safe, The Christmas Season has begun, here in Puerto Rico and yet we find ourselves needing vigilence in our stormwatch. Invest 94 is in the Western Atlantic, just to our Northeast, with the potential to become a storm. Our waters are cooling, but that doesn't mean we can't have a storm. Remember, Nature can't read the Gregorian Calendar. So, for the next few days, let's watch Invest 94 for development and be careful of the waves it is producing on the north shore of Puerto Rico. STATEMENTS ISSUED BY YOUR LOCAL WEATHER OFFICE. TO SAFELY SWIM TO SHORE. LINE AND STAY OFF OF ROCK FORMATIONS. EROSION DURING TIMES OF HIGH TIDE. This is to inform that here in San Juan, Puerto Rico we felt the treemor at 3 pm. We were in an office and all furniture started swaying. It lasted about 10 seconds. It was comparable to the strongest tremors felt here in the last 10-20 years. 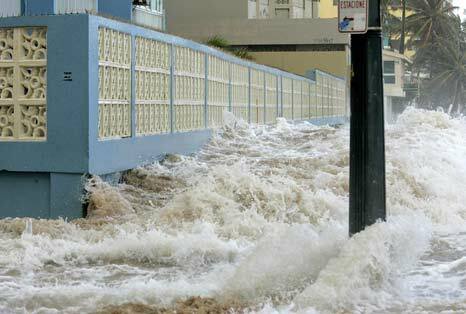 In some parts of San JUan there was panic among people in high buildings which were evacuated. There were reports of the tremor being felt all over the island of Puerto Rico. But no reports of damage so far. Just scared people. So THAT'S why we're getting so much rainy weather this weekend...There's a storm brewing just south of Haiti and it's drenching Puerto Rico and the VI. Fear not, it's heading north over Cuba and the Bahamas. Sunny Puerto Rico will see the sun again! 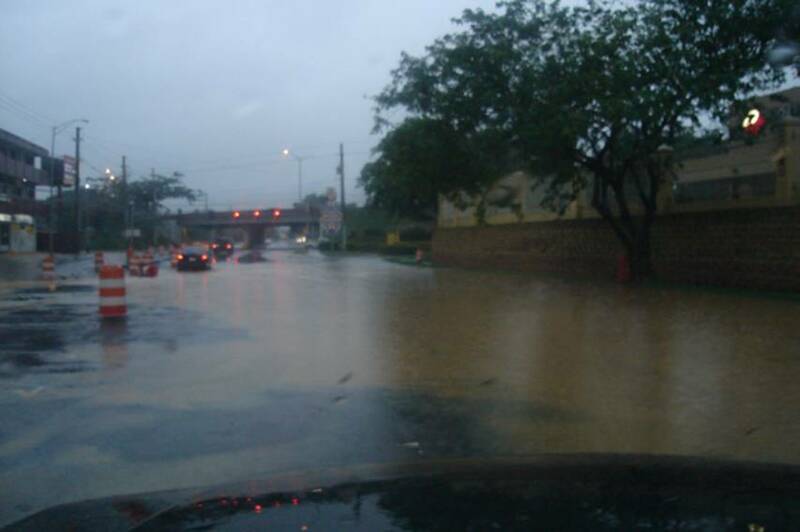 We have had some local street flooding in nearby towns of Cataño and Bayamón. Levittown, however, drains very well. 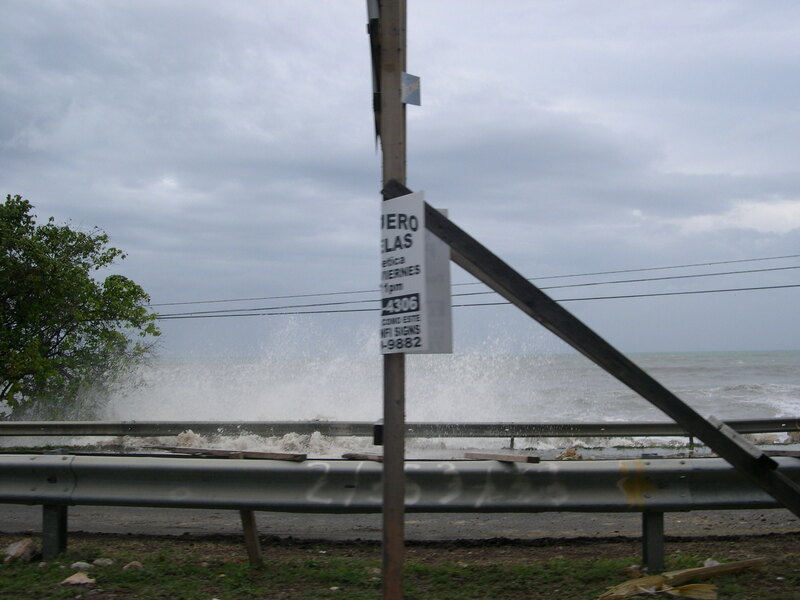 The Atlantic Ocean at the Bridge of Flags (Puente de Bandejas) in Levittown is BROWN from the river waters from Rio Hondo and Rio Bayamón pouring out to sea. It's been very breezy, too. Otherwise, it's been a great weekend to stay home and make chicken soup (sopa de pollo) and stay warm. 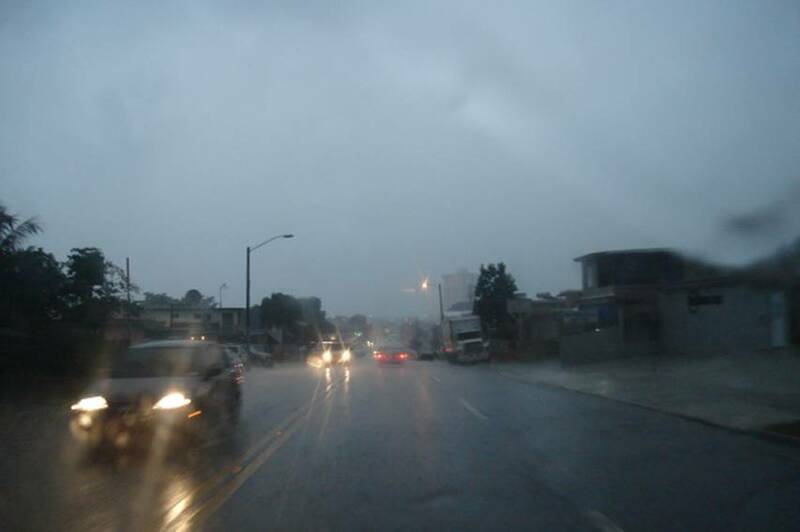 - Puerto Rico In Water Rain! Today we wakeup, with more water that yesterday. Yesterday, I pickup 3.125” of rain in my rain gauge, the winds ware calm, in some time hard like 12mph, and the temperature Maximum 78.4° F and minimum 72.3° F, so cool. In the night, light rain, but constant. Look at the Photos and see yourself. Woke up to gusty winds, and no power at 4:30 AM, showers have been pretty much on and off as a result of the weather system that is moving west. Yes just like the sea, Waves come and waves go. We've seen many come and go the past few weeks and the north shore of Puerto Rico is WET WET WET. Which in the tropics means one thing: MOSQUITOS! Puerto Rico has announced an epidemic of over 7,000 cases of suspected dengue of which 25% are confirmed, already. We know that number is low, because it takes time to report all those cases to El Departmento de Salud. And of course the more dangerous form is hemorrhagic dengue which killed a child this year. As a result, our emergency rooms have been flooded with people. One small ER saw over 7,000 patients last month, where the normal volume is less than 4,000 per month. And so, the Dept de Salud is begging citizens to take action: KEEP all water sources covered and collection vessels empty, DAILY! We are experiencing a short break from the daily heavy rains. We also know THAT won't last long in the midst of the rainy season. Otherwise, things are as normal as they get en la Isla del Encanto. Stay vigilant, it's only mid Oct and things can happen fast and furious. Sí, esta solo médio del octubre y las cosas pasa con fuerce y rápido! Observa con vigilancia. 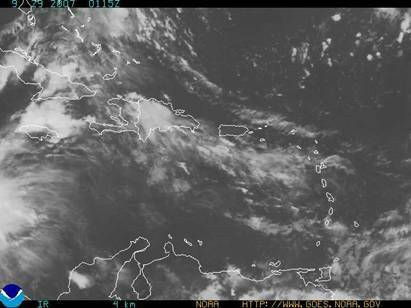 Today, Puerto Rico, most Sunny Day, Temperature 86.9°F, winds 5 MPH, not rain, humidity 65%, Beauty Day. Well, in the vicinity we have a Tropical Wave (91L), that going to the west as 10 mph (proximity), in the last hours his course is to SW (at 230° aprox). It’s the clouds outside of the perimeter of the weak Low pressure at sea level. In the last satellite photo, her cold clouds diminish, but insist in survive until find more warm water, at this moment the season is download in intensity. It’s interesting that in this part of the season at upper level in the atmosphere it’s find jet winds journey SW to NE at 60, 50, 40 degrade in Atlantic, almost always these winds are in summer. But that said Gert, Lenny, it’s made her debut on November 15, 1999, and leave us with open mouth. So, don’t think that is all. We will be watching the Atlantic until December. 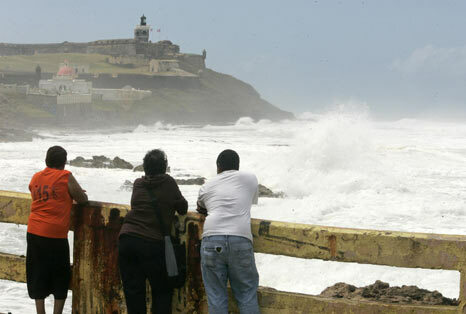 - Weather Puerto Rico...and more! Today we wakeup with a most sunny day with less clouds that yesterday. The temperature in our area is 76.8° F with not winds, not rains, humidity 74%, pressure 29.88”. It’s a nice day in “La Isla del Encanto”. But I be watch the Tropical Wave like a 1,383 miles of P.R. at this moment it’s try to organize her clouds, but upper winds is there. The weather change each time, and is the last two moths of hurricane season. The luck is that the winds in the upper atmosphere impede her development. But remember the winds it’s not will be there all the time. So, we will be watching this phenomenon in case that becomes a depression. Puerto Rico is submerge in rains, in the last 2 hours the rain gauge is 1.437”, now the National Weather Service has a warning issue to our area. 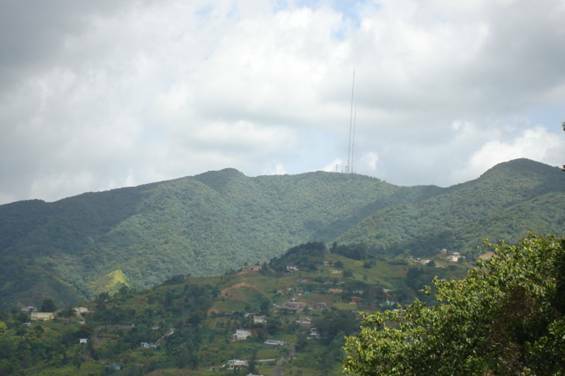 BUENAS...BARRANQUITAS...NARANJITO AND GUAYNABO (The Green Area) including Saint Croix. The wind is in calm, the temperature now 77° F and the rain is light in this moments. So., we go to have a Nice, cool night. CARIBBEAN WATERS TO THE NORTH AND EAST OF PUERTO RICO...INCLUDING THE U.S. 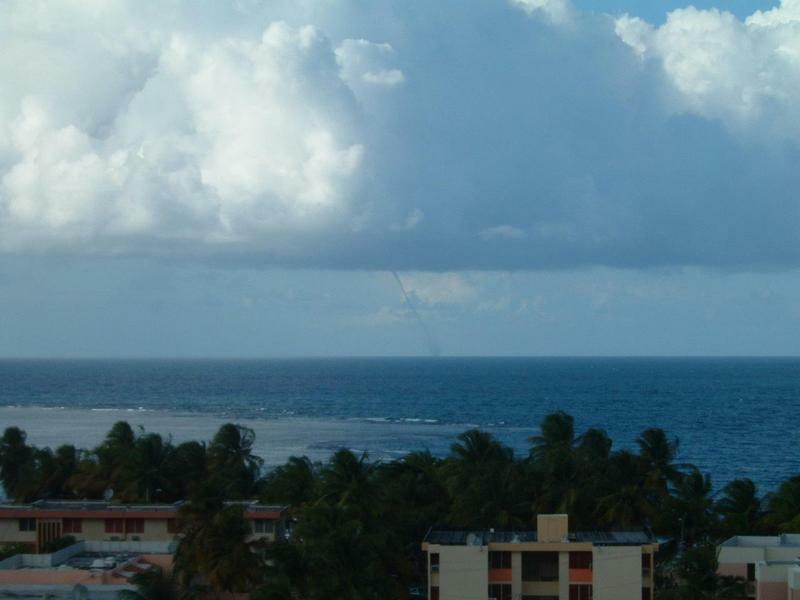 AFFECTING THE LOCAL WATERS NORTH OF PUERTO RICO AND THE U.S. CREATING CHOPPY SEAS ACROSS THESE WATERS. Today's weather was a repeat of yesterday. Sunny in the morning, cloudy by noon and HEAVY showers all afternoon. And at 5pm, the sun has reappeared. The canal at Levittown is once again risen. Not flooding, but it's higher than it usually is the rest of the year. We have a cement wall at the water's edge and it is usually 6 to 10 inches about the water. It's under 2 to 4 inches of water. The turtles are swarming, and the herons are feeding on lizards, and fish. The kingfishers are busy, too. It's a cool 76 degrees an hour before sunset, and that means we're in for a cool night, tonight. Although forecasts are only 75 degrees overnight. The morning commute should be sunny, dry and warm with a high of 88 degrees. Here in Toa Baja it's sunny and beautiful as we're drying out from the drenching rains. WOW! all I can say is WOW! Saturday was a WET WET WET WET WET afternoon. We got many inches of rain in a few short hours, enough to make the canal come up over the edge of its banks in Levittown. And again, this morning is clear and sunny, but there are some wet looking clouds on radar heading this direction. As I check out the radar, Karen has vanished. And Melissa is sluggish to say the least. Hopefully she'll go the direction of all her girl-friends. Temperatures here in Toa Baja are 83 with winds out of the east at 9mph and our humidity a dry 69% making the air feel like 93%. Visibility is good at 10 miles and seas are calm. AccuWeather says our dew point is 72. Thankfully we never get that cool here! The sun rose at 6:15am and will set tonight in what appears to be stormy weather at 6:14pm. This season is much last 2006 for us, and we hope it continues to be the same. Puerto Rico….. Beautiful Morning with much sun, at the hills and valleys, no rain in this moment, and the temperature is 79.9° F, with some kind of clouds. The winds are in calm with no other event. Great! Karen, Oh! Karen….. you resist to died…. Karen (depression), it’s fighting ..WOW!...with wind shear, and its hard to die. No matter that other say. She undertake her run to be alive, and become close to us, to bring us some rain… and maybe winds. 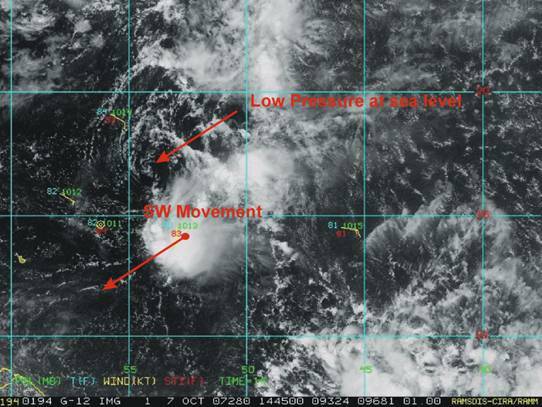 In the observation of the satellite photos, we can appreciate that Karen, her movement is to west in the last 6 to 12 hours, I don’t understand why the forecasters insist that the movement is to WNW. In future Karen go to be close to us, and waiting to disappear the wind shear or download to moderate to run again like Storm. It’s interesting to see that she persist in circulation at sea level that never lost. So, we have to be monitoring close Karen for any event, can arise. - Karen... The Incomprehensible Girl ! Well…. Karen is the unique Storm that I remember for most years…. 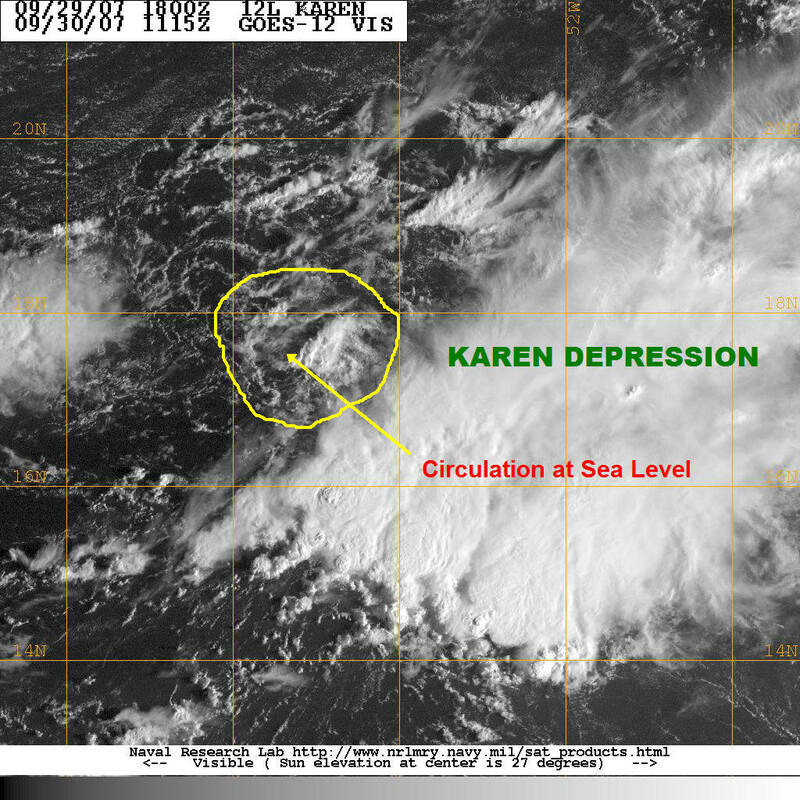 Its wonderful see as Karen is fighting with the wind shear and survive like Storm. In various occasions, the winds was down, but never lose the characteristic as she get in the beginning. The nature to be determined in destroy Karen, but energy, tenacity, perseverance, keeping it’s alive. The heats in the sea down there Karen supply the energy to Karen run away of the menace of the winds. We can see the powerful of the nature, that the men’s can understand. We are learning every day how is the function and the importance of the hurricane and storm in the balance in the world (between heat and cold). So, Karen persist in run to wnw, and looking for in Atlantic the way to be there for long time. We get to look close Karen to learn more about she!. Yes, we do get rainy days. Not many but we do get them. However, here in Toa Baja, it's been just a few light showers this morning with some scattered clouds. BUT...last night was a different story with spectacular Lightning and thunder along with some locally heavy showers. Everything looks freshly washed today. I see that Invest 97 is passing Puerto Rico's north shore and headed west. I also see that TS Karen's right arm is dragging in the water today, as she continues to turn northward toward the Bahamas. Let's hope she continues this trend and doesn't find the Caribbean. The rumored TS Lorenzo is taking up residence in the souther Yucatan Peninsula, hence no worries for him finding Puerto Rico. Nevertheless, we remain vigilant and ready for this higher than average active hurricane season. Strong Vawe are on Puerto Rico.... Begining for the East Area. The thunderstorm so continuous with a light rain. Let's hope that TS Karen keeps her right arm in the water until she swings well past us. We'll have enough rain this week. Otherwise, things are pretty normal here in Levittown. I guess it was hotter than usual today, as we had a record number of iguanas sunning themselves in the yard. We had a very hot, sunny day until about an hour ago when the clouds began to roll in. Currently it's cooled off to 85 degrees and should reach a low of 77 tonight. Sun will set at 6:18pm and rise tomorrow at 6:14am. Our humidity is 72%, wind out of the ENE at 9mph and, ready for this? The WIND CHILL is 92 degrees according to weather.com. I got a chuckle when I realized they include wind chill in the tropics. Here in Levittown, it's been delightfully sunny, it's been raining hard, we've had thunder storms, and there's been clouds. It's quite the mixed bag. Nothing severe, except that it's been hot. The Atlantic has been calm, here. The beaches have been very pleasant. I notice Christmas, Thanksgiving and Halloween are in the stores. But alas, no snowstorms in our forecast hehehehehe. Just easterly breezes and warm seas. - Nice Day.... But Watch to east ! Puerto Rico….. A Nice Day…. Some clouds, Nothing it’s serious. Temperature in 86 F, Wind is breezing, Rain… Not rain. But…. Looking to east in Atlantic 2 waves run there, waiting to grow. I have a theory about the Hurricane season in this times. We are bring forward in time, now like said Isabel, October seem is the Peak of the Hurricane Season. I am following the Hurricanes when I was a child, before at the personal computers, I make calculations, collecting information of the patterns in the Atlantic. I can to say that season time run out for the setting that is June 1 to Nov 30. In the close future we can see Storms in December…. And is possible in January. We are interfering in the geoclimatic cycling, we our human’s activities. Well, that is an other 20 Dollars! The wave that is SSW at the Cape Verde Islands, run vigorous, and we have to check it in the few days…..By the other…. The Atlantic is so quiet! Today was a Sunny Day, with the exception, for Guavate (Montaña Santa), this area is susceptible to the rain. In the mayor of the time have clouds. For the rest, everything is ok. But whatever, we need rain…. 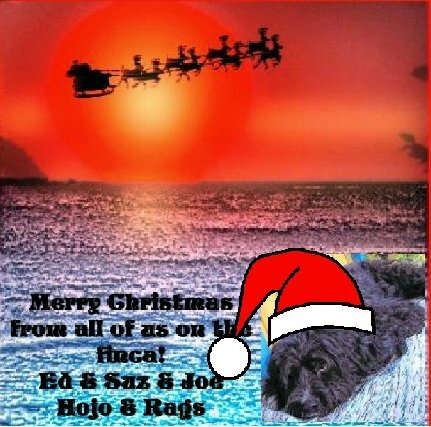 All is wonderful in our Island…. “La Isla del Encanto” Puerto Rico. - Ingrid Say...." I BE BACK "
But the last photography of the satellite the system seems is right now. The north of Leeward Island, have to be in observation this system close. Anguilla, San Martin San Bartolommeo, San Eustaquio, Barbuda, Nevis, San Cristobal, All Virgin Islands and Puerto Rico. 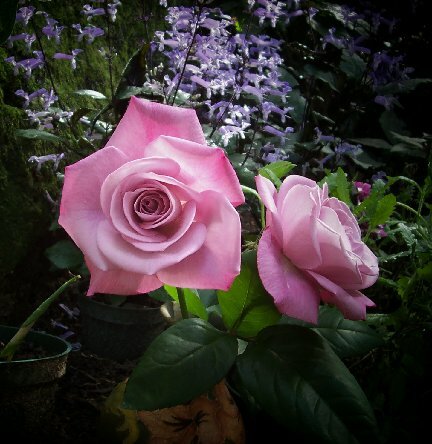 I think that we will have much rain in our area, with some kind of winds… Maybe….. Open Eyes!!!. Well, this morning, The National Hurrican Center officially laid her to rest at 18.3 x 62.3 and declared Ingrid as DISSAPATED in Franklin's report. It seems Ingrid ran into so hostile upper level wind sheer and lost her balance, as Franklin said, ""No longer qualifies as a tropical cyclone." Well, Ingrid and the disturbance in the central Caribbean seem to be influencing weather here in Puerto Rico. Yesterday reminded me of a fall day in Pennsylvania: dark, cloudy, gray and misty rain. All that was missing were the crunch of dead leaves in the air. And once again, this morning is sunny and beautiful but there are huge fluffy cumulus clouds to our north in the Atlantic and big dark clouds looming inland over the mountains to the south of us. The air is still, and quiet. As I look at the sattelite, I see a huge mass of moisture moving over The Island from the Caribbean and the remnants of TD Ingrid hanging around to our north and east. We could be in for a wet week. Otherwise, things on our tropical Enchanted Isle are typical for this time of year. Grocery stores are packed over the weekend (they always are) and the malls were busy, as were the beaches and pueblos celebrating life. And so, Él Tapon (literally the drain plug, but its slang for traffic jams) lives on the highways and byways of Puerto Rico. As always, traffic was heavy everywhere in the Metro-San Juan area. Levittown is bustling this morning, with the Monday Morning Ladies out for their walk from the Sports Complex and the next aerobics class was forming on the grassy inner track. We continue to be vigilant about Atlantic disturbances off the Ivory Coast and Cape Verde Islands for our next wave of weather. Wow!!!!....Wow!!!!...... Ingrid get the meteorology without Ideas. Now they emit precaution to the north of Leeward Island, because don’t know if Mrs. Ingrid run to us or turn to north. I was be watching Ingrid about 5 hours, and the center was in the same place, only walking in circles…. Hummmm….. I think that Mrs. Ingrid is make time to catch us, with the pants down!!!.. Everything is alright here…… Sunny Day with some clouds, but not is a big deal! … Well…. 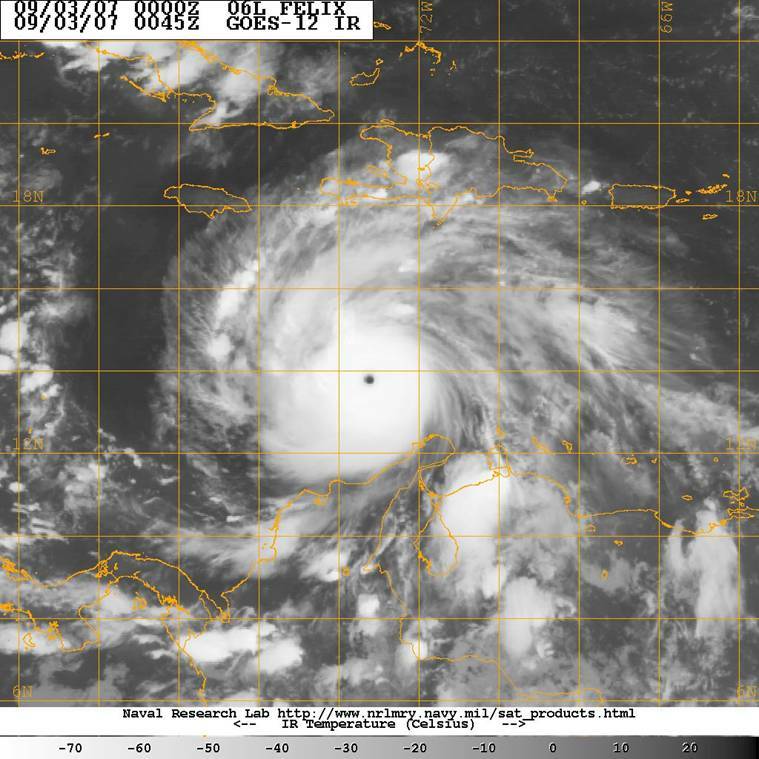 The satellite photos show a Ingrid, in good shape…. They say (NHC), she have to be weak, but I don’t think so!... I was looking in the last 10 hours, her movement is to west (westward), and they insist that she turn to more to north. Ingrid, have problems with her track, in some time she lost characteristic, integrity , but don’t loose concept of tropical storm. Yes, now is a tropical depression, I think that she go to take up again her personality of storm. Only we have to wait time to see that. Ahhhhh don’t remember we haves to be in attention to the other phenomenon in deep of Atlantic, by the parallel 10. - Ingrid: If I knew you were coming I'd have baked a cake! Well, as most females are unpredictable and surprising, Ingrid seems to have all female characteristics. She has vascilated from Tropical Depression to Tropical Storm to Tropical Depression and she has headed North, Northwest, Westward and The NHC's Avila says Ingrid should experience lots of wind shear from the upper level ridge, turn west a little while, then northwest and weaken, possible strengthening farther, beyond the Leeward Islands. The GFDL computer model is the only one showing westward movement, all others show a northward turn and all seem to predict weakening. Ingrid DID weaken today to a Tropical Depression, again. And so, another storm is hopefully blinded to the Leeward Islands. HOORAY! 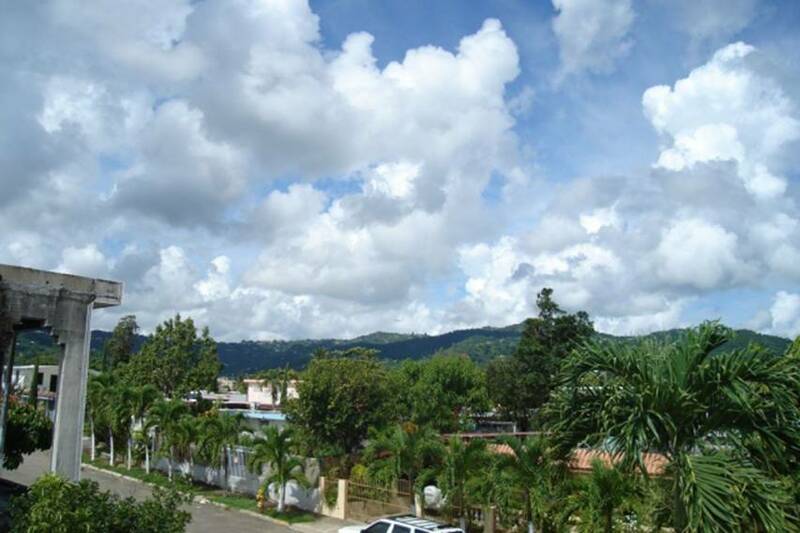 Here in Toa Baja, we have had quite a basket of weather, starting off with brilliant sunshine this morning, to showers and more sunshine throughout the day. I always remember the description of weather in New England: "If you don't like the weath-ah, wait a few minutes, it'll change." Seems to hold true here in Puerto Rico, too. Tonite, we're partly cloudy, with scattered thundershowers and temperatures 77-80. Neighbors are enjoying their boat in the canal and once again, I mowed the quick-growing lawn. Of course, daily rains tend to help that along. It was a great day for Vega Baja's Agriculture/Exotic Bird Show, and Dorado's Town and Country Celebration, as well. We sampled Alcapuria, Bacalauito and found some beautiful orchids for 5 bucks to add to our collection. The Atlantic Ocean was as calm as glass today at Levittown (Thanks for cleaning up the beaches! ), it looked like "Lake Puerto Rico." 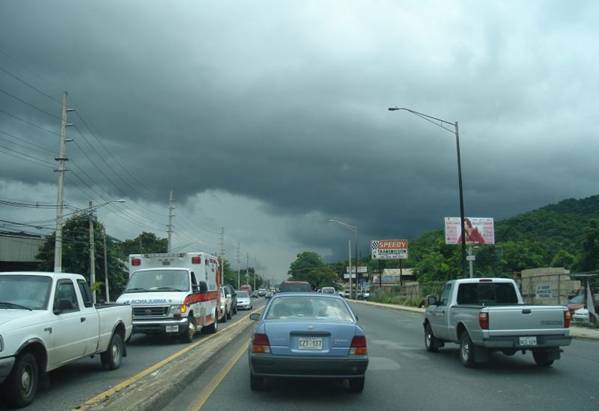 Even Guaynabo, was sunny with a few scattered showers today. We did a lot of traveling today. So, to my family and friends who monitor this site, and my comments, we appear to be skirting yet, another one. YOU on the other hand, have been getting rather extreme weather with flash flooding, hail and dangerous lightning damage. I've had reports of lightning damaging homes and property in Pennsylvania and Maine. Gracias a Dios, no one was hurt. - Ingrid...... at #$% What up! The nature …. What Nature!!!!!...... 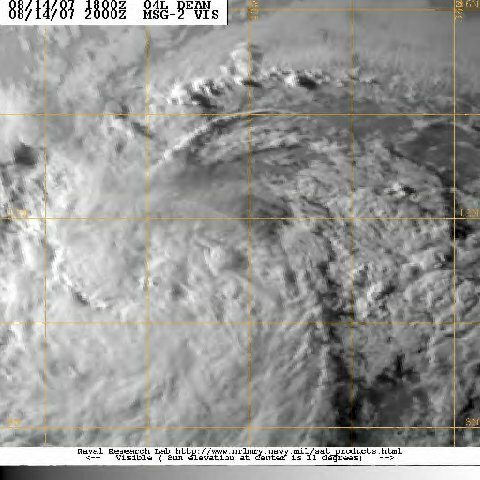 the forecast of Ingrid, all the time was to WNW and NW….. Now Ingrid is insist go to us!!!!.... maybe it let us time to be ready for she!... But believe or not we have to be, waiting for she, what gonna do! Go up or bring to us some kind of heavy rain or decide be Storm. The rest of the season seem be not clear…. For the decision of the tropical waves. 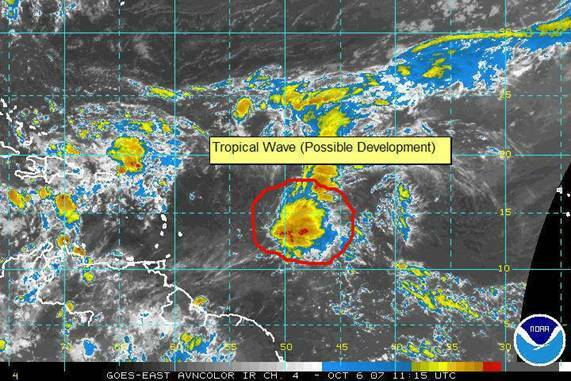 This morning the two low pressures that was in the Atlantic, disappear like magic, now are Tropical waves. Well, Now I am looking close to Ingrid, for her decision….. 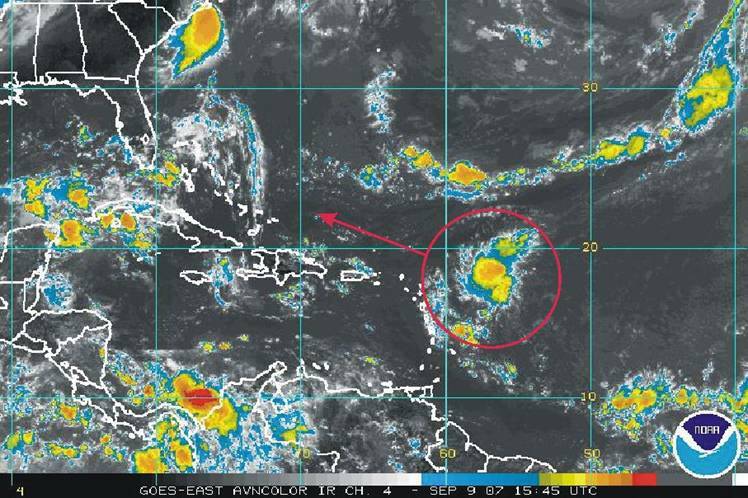 I said yesterday, the Tropical wave next to Leeward Islands (Sotavento), have a convective improvement that make a Tropical depression. Maybe in some day, but the NHC said the movement is to westward I think that go to WNW (like 290). The Bahamas Islands have to watch this system for following days. I was seeing this phenomena of a group of clouds, and it’s look like the we have the next Storm. The NHC, don’t said anything about this. But I am following his trajectory, in some days and it’s possible that the Bahamas have a storm there. Gabrielle is born as a ...a...a SUB - TROPICAL - STORM?! Umm, forgive me, I'm a little new at this, but, whattheheckizzat? I've never heard of a SUBtropical storm. Is that like almost pregnant? Aww c'mon guys, that's a stretch. It wasn't even called a tropical depression. However, SUBtropical Storm Gabrielle is building up steam to make landfall in the Carolinas and head northeast, then to sea. Not much concern for the islands. BUT, off to the east, Puerto Rico and other islands need to be vigilant and mindful of other systems developing in the Atlantic. There is one on it's way and it's too early to tell what its future may bring to us. It may even become a SUB-tropical storm, folks, so beware! (chuckle) Sorry, I couldn't resist. Here in Levittown, on Puerto Rico's North Shore/SUB-metro area it's cloudy and we're having showers, heavy at times, with some accompanying lightning and thunder. Not exactly a nice beach day, but I'm sure the malls and restaurants are crowded. So be careful and stay safe out there on those wet highways and roadways. I had a rather busy personal day, yesterday, but nevertheless, the first thing I did, was to check weather status for the Atlantic and Caribbean, which has become a habit, this time of year. I felt as though I was living the poem: The Night Before Christmas. "I flew to the window in a flash, threw open the shutters and raised up the sash. When, what to my eyes should appear?" 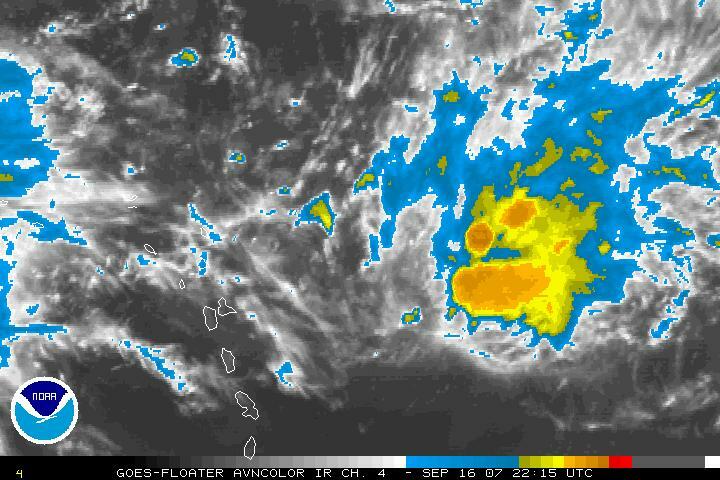 Invest 98 has DISAPPEARED! I shouted: LOOK! LOOK! It disappeared! Was I dreaming? 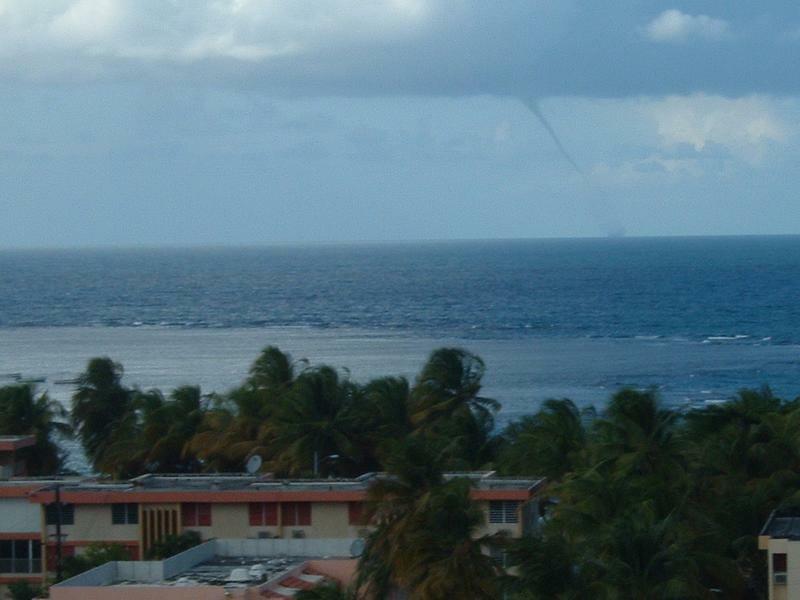 Was there really a possible storm brewing in the Atlantic destined for the Antilles Islands? We'll never know, will we? THIS morning, I find Felix is now a Tropical Storm, albeit a DANGEROUS one dumping, not inches, FEET of rain on the Central Americas. My prayers go out to them, as they don't usually get these types of storms and so, as described by others, lots of flash flooding and mud slides. Bendigate! Here in Puerto Rico, it is sunny most of the time. This time of year, the hot days yield to storms late in the day and yesterday was no exception. Around 3pm, the dark clouds (los nebulos oscuros) rolled in to the Metro/North Shore area and yielded a nice tropical rain storm on the area into the darkness of the evening. The dogs got nervous when the lightning and thunder (la luz y rompe fuerte sobremos) broke and sent them to their respective hiding places for comfort. THIS morning is beautiful and sunny with clear, bright blue skies, a light breeze and the birds are chirping. But, since the full moon has passed, I'm sure our weather pattern is set for the next few weeks, sunny mornings, cloudy afternoons and rainy evenings until the next full moon. Let's hope Mom Nature doesn't throw any big surprises our way. 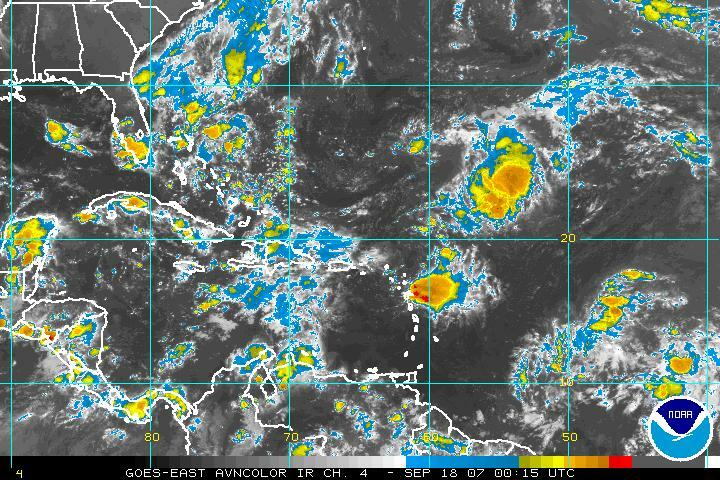 - Shhhhh, this one missed us, too..
let's hope 98 invest doesn't know where Puerto Rico is, either. I feel guilty discussing Levittown's weather but, we have been warm and sunny except for some heavy thunder shower activity this weekend during the town's 44th anniversary finale of the 5 day celebration, complete with fireworks. The carnival atmosphere was dampened just before dinnertime, however, our neighbors in San Juan stayed dry for the excellent concert of Puerto Rico's Philharmonic Orchestra, free in the Luis Muñoz Rivera Park. Today, Levittown has been dry, sunny and a bit cooler than the past week, with a nice easterly breeze. 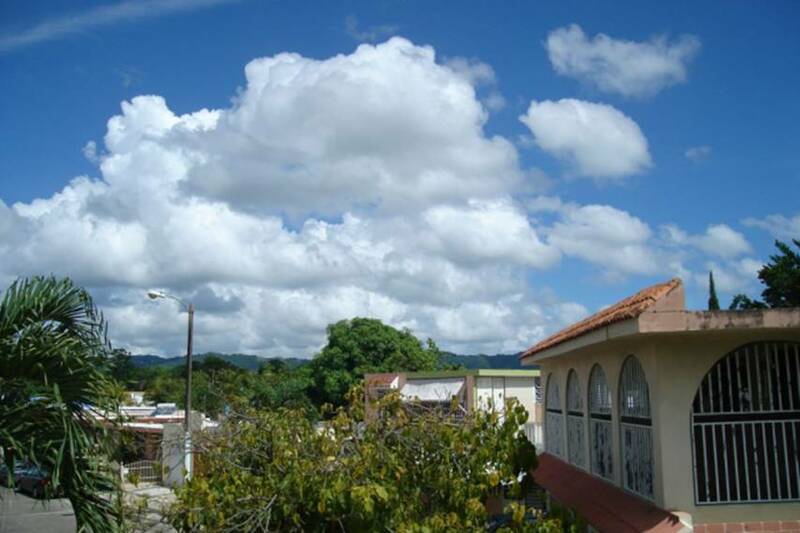 Currently, Toa Baja is 87 degrees under sunny skies. Felix, Category 5 and growing is a frightful thought in the western Caribbean and headed for Nicaragua. The only picture my mind can conjure up was a photo I saw of a poor frail old main placing bricks on his loose tin roof in preparation for the hurricane. Some people in our neighboring islands and countries have no idea of the awesome power of nature at work with a category 5 hurricane. I hope and pray that Central America will be spared as we have been spared. - ¡Ahy viene el Huracan! Wow, Félix, it’s a Monster! In the Caribbean Sea…… Now have winds of 165MPH, and Yucatan it’s possible that take this “Huracan”. don’t cause some dead in land. I believe, that “Félix” go to be the most Powerful Hurricane, in this season. Now Jamaica, will be in calm, because the only that they will have it’s rain. As Labor Day approaches, so does September with it's notorious stormy weather. Invest 94 just off the coast of eastern Venezuela is desperately trying to become TS Felix today and is dumping lots of rain on Tobago and Trinidad. Hurricane Hunters are investigating the winds as I write this. Dave expects this to be a named storm by the time they report off. Computer models have Felix moving similar to the Dean's central Caribbean track. We will see. Here in "Sunny" Puerto Rico, it's 85 degrees under cloudy skies with occasional showers. The humidity is soupy. Awaiting further reports, like everyone else. 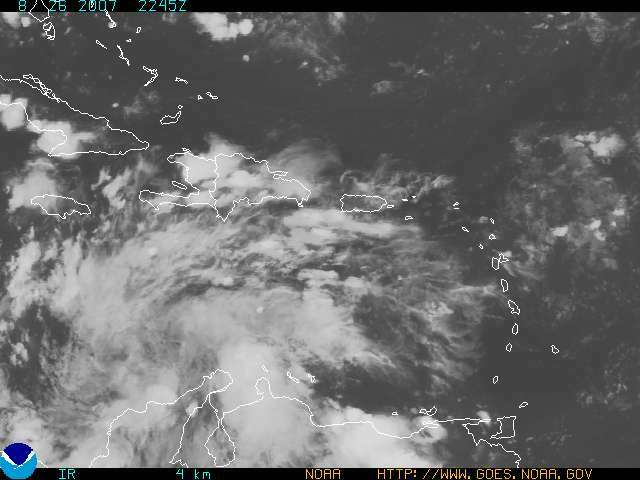 As the hot summer sun has been scorching the North Shore this week, today is a welcome break as a band of clouds makes its way across Puerto Rico, bringing cool moisture to the parched land. The egrets are flying about, ready to munch on the lizards as they climb atop the bushes and trees to escape the rains. The turtles are skimming the water's surface hoping to find something, as well. I've finished powerwashing my roof, and now I'm ready for the next sunny day to paint it with waterproofing. Ah, the joys of home maintenance. After the rains, today, it will be time, once again, to mow the lawn. With the cloud cover, the iguanas won't be sunning themselves on the lawn but, the larger land crabs will be out of their watersoaked holes in search of food and shelter. The little ones will probably make their way on the patio for a dry landing. This week is Levittown's 44th anniversary since Mr Levitt first founded the parcel of land here in Toa Baja to develop our city to it's bustling suburban haven of Metro San Juan. The park field is filled with rides and carnival stands with lots of bacalauitos, alcapurrias, donitas, pizza and of course...your favorite cold libations. The fireworks were beautiful, and we could watch them from our front yard to see the entire show. The carnival is slated to finish on Sunday, Sept 2. Queens and princesses have been crowned and all of Levittown turns out this weekend for the merriment. Of course, when I asked my neighbor what was happening, he shrugged his shoulders and said, "eh, another fiesta. There's one every week here in Puerto Rico, you know we love a party for anything!" It's true. Now in this picture see it some rotation the clouds. The NHC don’t say anything. But we had to watch this system, for the following days! -54.7 Long, 22.3 Lat Wind Speed 25 and directional speed WNW at 14mph, Bar Pressure 1009.0 and steady. -56-3 Long, 22.5 Lat Wind Speed 25 and directional speed WNW at 16mph, Bar Pressure 1009.0 and steady. 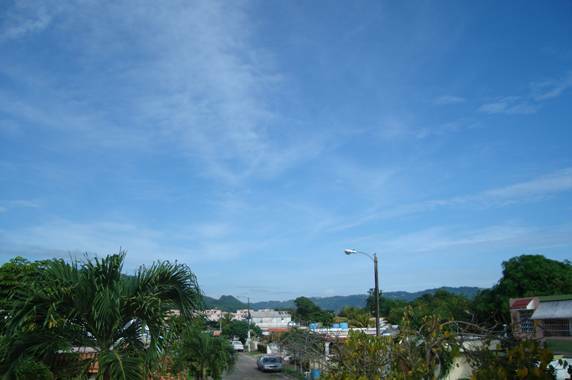 Here in Toa Baja, Levittown has 87 Sunny degrees with a patchy white clouds, light easterly breeze and it's humid. It feels like summer. The Ocean is calm with swells in the normal range. The grass certainly enjoyed the weekend bath, it grew several inches. Everyone was thankful that we were spared Dean's wrath. I'm reading now, that Mexico is preparing for Dean. Vaya con Dios. 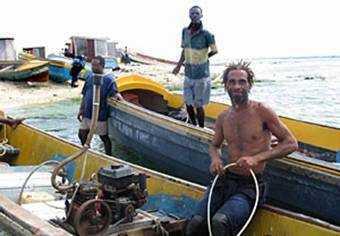 Now these men, are in the Pedro Cays, like 50 or 80 Kms. South Jamaica. They live there, and I guess that they have a place to be safe. Wow! I don’t believe that the governor of Jamaica don’t know about them. GOD WILL BE WE THEM!!!!!! First, a prayer for all those in Jamaica and it's waters. Bendigate y vaya con Dios...may you be spared Dean's wrath. Conditions on the North Shore, Toa Baja area are sunny and breezy with temperatures approaching 91 degrees. 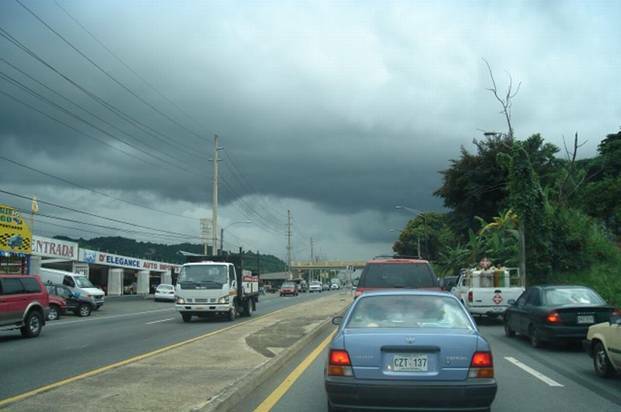 There are dark clouds over Bayamón, which I assume are rain clouds heading this way for the afternoon (lluvia en la tarde de San Juan). My eyes are still on the Atlantic waters at Cape Verde as a few disturbances dot the radar. Our future weather. Let's hope they remain tropical waves. This morning a small flock of parrots flew overhead, if I only had my camera in my hand. One of nature's thrills. Otherwise, things are quite normal here on the Enchanted Isle. View of DEAN from the Internat'l Space Station! 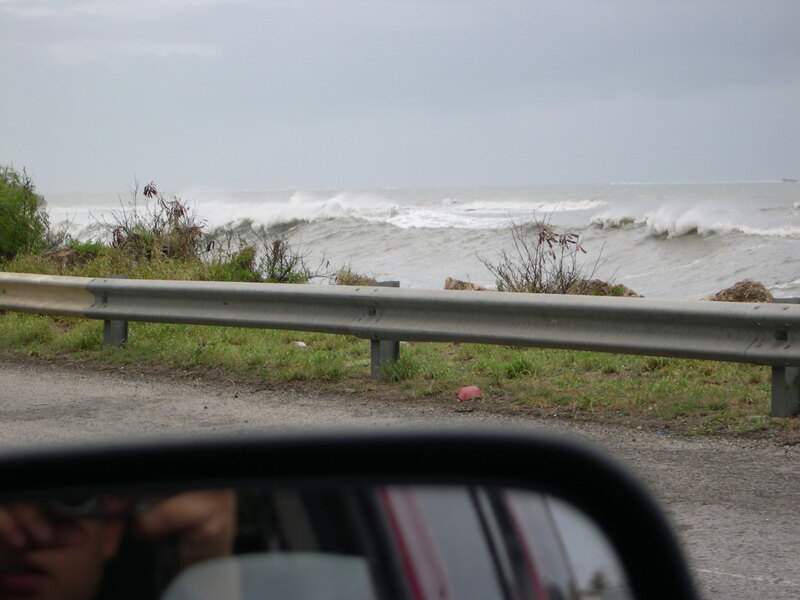 Dean passes through the south coast of Puerto Rico. Well, Dean is well on his way to Jamaica. Here on the North Shore, we certainly were spared. Just some squalls this afternoon with some impressive wind and heavy rain in short time spans. The radar looks as thought there's about 100 miles worth of these squalls to come, yet. We will get our much needed rain to clean the island and make up for the dry spells we had this spring. impressive as we are so far north of the eye. He's a big old hulk, moving at 15 mph across the Caribbean and Dean still hasn't cleared Puerto Rico. Winds are at 150mph with gusts to 185mph and he is still a Category 4 Hurricane with the potential of more. Stalling in the Caribbean isn't good either. Until we can wave bye bye to Dean, we need to be vigilant and stay alert to his location. I looked at the satellite picture and he's barely moving across The Sea, just sucking up that salt water and air. Here in Levittown, it's an eery, quiet, barely breezey morning. The palm tree fronds and banana tree leaves aren't even moving. The ground is wet from squalls during the night but, nothing appears to have moved from the winds. Let's hope the sunlight gives him some "get up and go." It's rather cloudy in our backyard, the Banana Quits are chirping, the lizards are hopping across the bushes and little doggies are avoiding the tall wet grass. They don't like wet bellies. Howver, the big dog doesn't mind it a bit and is checking the canal for iguanas. Even the usual breakfast crowd of turtles and fish are schooled around the boat ramp. It APPEARS to be a normal morning here. I'll keep everyone south of us in my prayers. Check out the wave heights! islands downwind of this storm. 3+ hours, mostly along SE coast. I haven't seen a drop in Santurce, and a gust every now and then. Not to signify that Dean is a Cat 4, impressive on satellite images. Now, Caguas, No rains, no winds, all in calm. We are waiting for the rain and winds. We are in Storm warning. Dean have in it outflow high cloud, don’t have rains! Winds are picking up here in Isla Verde. They are coming from the East at approximately 25-30 MPH. There are a few clouds present, but no rain. 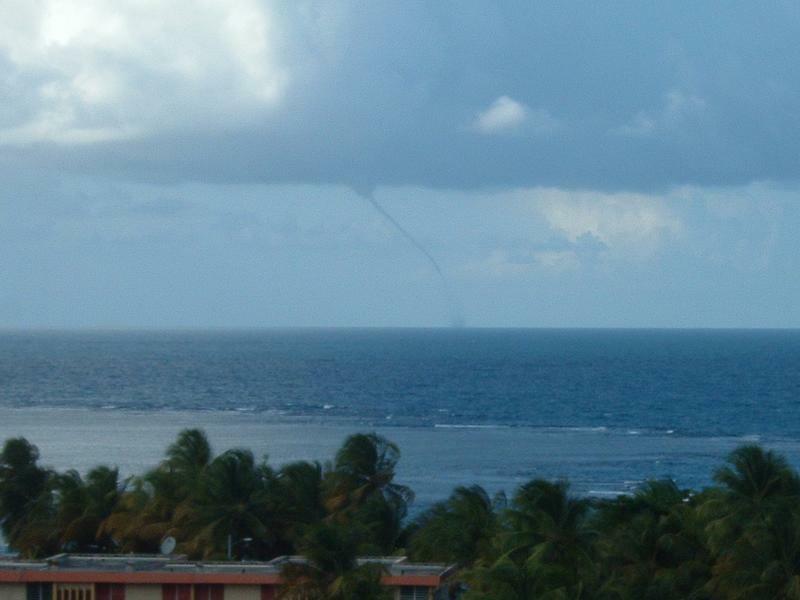 Looks like Dean is still on his predicted path through the Caribbean. The Tropical Storm Watch for the North Shore of Puerto Rico has been canceled by the NWS because Dean is living in the Caribbean, and not in the Atlantic. Therefore, we can see the Atlantic Waters are relatively calm here, with the normal 3-5 foot swells and the usual waves lapping the beaches. The Rio Hondo/Rio Bayamon Bridge of Flags shows the usual winds as the flags wave in the breeze. It's still partly sunny here in Levittown, and we can see very dark clouds and what looks like rain in the mountains. The grocery stores are still busy with people chattering about the storm and buying everything in sight. It reminds me of the word SNOW in the northern states. When it is mentioned, bread and milk disappears from the store shelves immediately, as though in this day and age, the stores might never open again. And with that, we've taken the last of our orchids inside from the patio and secured the patio furniture. It feels like this i going to be along night. I'll continue to monitor conditions tonight and tomorrow with updates as necessary. 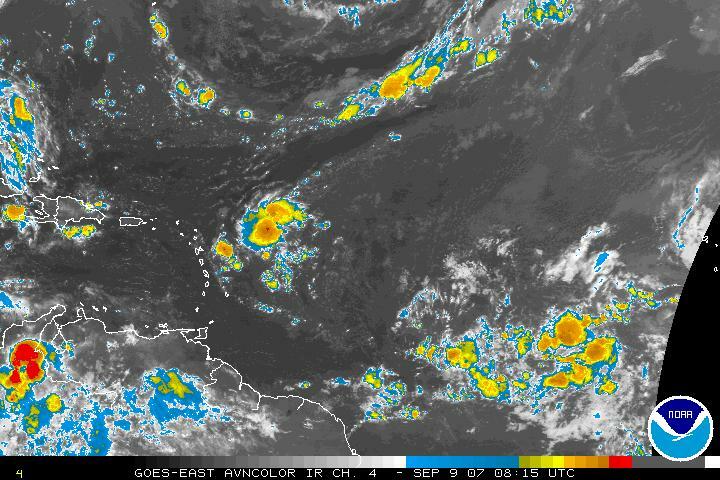 We’re putting together infrared satellite animations, as Dean enters the Caribbean. As Dean enters the local Doppler range, these images will also be animated. We’ll try to keep animations in manageable 8 hour chunks. Updates will be added as time and circumstances permit. Awaiting nightfall and Dean’s brunt. It just started raining here in Isla Verde. There are winds coming from the east-northeast at approximately 10 mph with a few 15-20 mph gusts. I am supposed to be doing college work but it is hard when my thoughts are with the folks in Barbados, St. Lucia, Martinique and others who have a long night ahead of them. Godspeed. Wanna know why Dean's not coming to Puerto Rico? It's not because he doesn't like Abuela's Rice and Beans or our Salsa. It's because of SAL, the Saharan Air Layer (or Sahara Dust as most of us know, that stuff that wreaks havoc on our sinuses) from Africa during the summer. Take a look at this picture of the SAL and how it's wrapped around Dean, keeping him under control. The link is on this site, but I've included it here for you to copy and paste to your browser's address window to make it easy to get to the University of Wisconsin's Radar picture of the Saharan Air Layer. Weather this week is moving as fast as a soccer (fútbal) game. Dean still seems to be driving by and waving to us this weekend and is a bit ahead of schedule. Let's hope he stays that way. Puerto Rico seems to be preparing for any hurricane, at this point, since several storms are developing simultaneously, with Erin in the Gulf of Mexico and a new tropical wave near Cape Verde, and Senegal. Another one to watch. Water, a precious commodity during past storms has disappeared from store shelves overnight. Along with stores overstocking shelves with canned goods and prepared foods. Otherwise, Puerto Rico is bustling as usual with it's traffic jams (él tapón) and neighborhoods (los vecinos) are emitting their usual dinnertime (sonidos de la cedas) sounds of children playing, the aroma of arroz (rice) and chuletas (pork chops), and people settling into their evening routines. 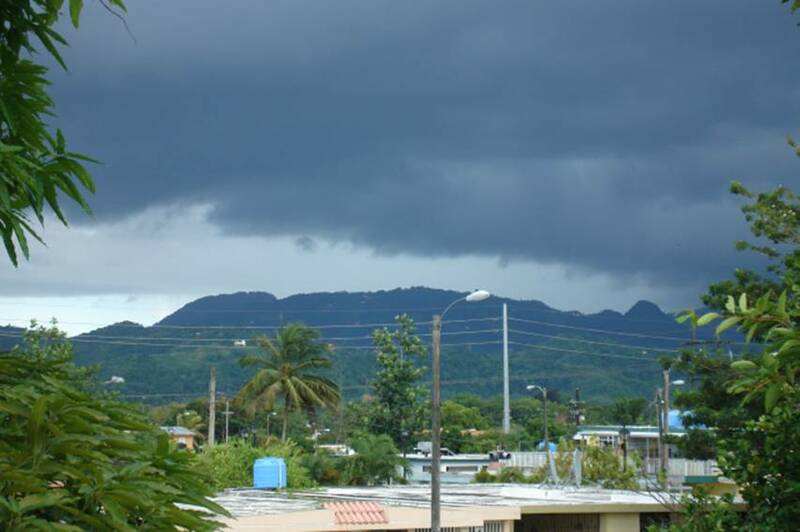 Weather-wise, the North Shore, Toa Baja saw some high temperatures in the 90's today with a few isolated showers in the area. The Atlantic surf seems quiet as the storm approaches. This evening promises to be partly cloudy to clear with temperatures down to 77 degrees by 5am with a few scattered thundershowers throughout the island. Tomorrow should see increasing clouds with temperatures about a high of 89 and some isolated showers. Not a big change, now is it? Right now, at dusk it's 85 degrees and partly cloudy in Toa Baja. Friends and neighbors recalled past storms of their experiences and how they were without power and water for a month, running out of dishes since they couldn't wash them, and no way to cook food. But the spirit of Puerto Ricans sticking together as family and friends, helped each other out in their times of need. This is not uncommon here. My neighbors value each other, because we live next to each other, unlike family who may be hours apart. It's nice to hear from many of you and to know that I'm giving you information that helps you in your daily routine. Feel free to drop me a line and either tell me I'm on track or give me a suggestion for these notes that will help you. 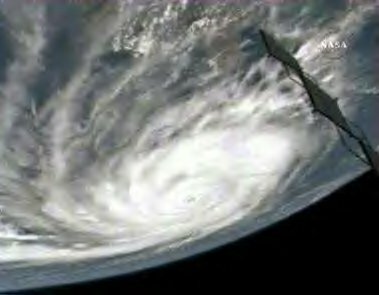 And to my Easterly Island Friends, BENDIGATE and stay safe as Dean passes through. Yes, the GOOD NEWS is, that Dean is taking a more southerly path than previously expected. And the good news is, he will be about 200 miles south of Puerto Rico. Nice seeing you Dean, but I know you're in a hurry...here's your hat. And the good news is, that Erin is already in the Gulf of Mexico and heading into Mexico's northern provinces. AND the good news is that Puerto Rico will get some rain from Dean. Which is much better than what we were expecting. A sigh of relief, this time. But don't let your guard down, yet. It's early in the season and we still need to be vigilant. It's hot again today, and the showers are a nice relief from the heat. And yes, the stores in Puerto Rico are busy, as always. And so it's back to battling the iguanas for my plants in the backyard, and cutting the grass down a foot at a time....ahhh the pleasures of life. Check out the rest of Gert's links and tabs, and just spend an evening or whatever time you like, exploring about hurricanes on the site. It's packed with great stuff. Have a wonderful day! Pasa Buen Día! Now!.... It’s being that the last update of the trayectory of Dean it’s go, near to Puerto Rico….Wow!.... I think it’s no real ! 1st. It’s most fall away of us!, 2nd. The forecast at long distance have many, many , error. We have to put the eyes, day by day into the progress of Dean, and be prepared to confront a Storm or Hurricane, in our zone. TD 4 is now officially Tropical Storm Dean and is still on track for an arrival on Sunday. Category and wind speeds are still unknown until it gets closer. Here in Toa Baja, it's 90 sunny degrees under partly cloudy skies with a nice easterly breeze moving the palm trees. I finished tying down my plastic shed and checked the rest of the yard. People in town are buzzing about (la tormenta viene) the storm coming. Hardware stores are busier than usual, as are the grocery stores. School and other businesses are as usual. I'm a registered nurse in a very busy Emergency Room, and I'm on the Hurricane Plan to work AFTER the storm. That means we'll be operating under an emergency plan that has half of our staff staying in the ER during the storm and then I'll be in with the other half of the staff to relieve them after the storm. Keep a watchful eye on Dean and stay safe! I'll keep updating you on local Puerto Rico North Shore happenings. For now, the NWS has issued their 5pm report, next report tonight at 11pm. We'll all keep our eyes on TD4 and Bendígate (God's Blessings to All). Well let's hope that the Saraha Dust and El Yunque can keep us safe and out of harm's way from this one. A disturbance just off Cape Verde now labeled Invest 90L is headed west with 4 computerized projections. It's interesting to see these models and how they work. Let's hope they're right and this one stays well to the south or north of us. Otherwise, this is the first of my warnings for the coming week to keep an eye on the Atlantic and get your last minute preparations underway. If you haven't prepared yet, Bendigate (God's Blessings) and GET READY NOW! Puerto Rico seems to be in a much more ready-state than most islands, I've seen in the Caribbean, but...nevertheless: PREPARE PREPARE PREPARE. I'll be keeping my eye on computer models and reports to pass on to you and doing my last minute preparations as well. Pass the word on to your neighbors to get ready. Pasar las palabras a sus vecinos: PREPARAR! lo que viene! Bendigate y Vaya con Dios. It's another quiet morning on the North Shore in Toa Baja. Our usual sunny morning is giving way to some dark clouds from the east. Typical for this time of year. 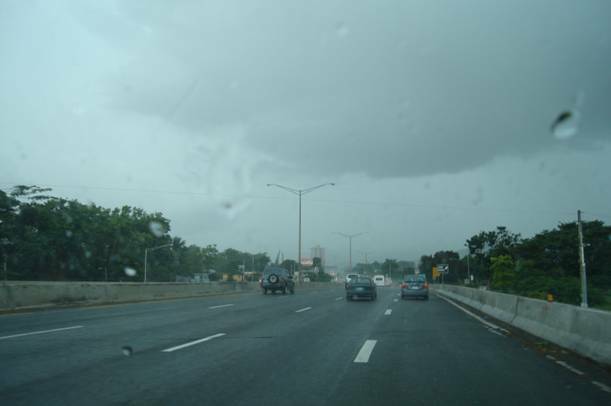 I'm sure we'll have (Esa tarde de lluvia en San Juan) that afternoon rain in San Juan, again today. We have had some typically heavy afternoon rains, which brings out the egrets and herons to feast on the lizards that climb on the bushes to escape the waters. It also brings out all the people to the shopping malls and restaurants! We experienced thunders and lightnings during the night, along with consistent, light rain. After sunrise all feels normal again, although there are a few clouds in the sky. At leas the roads look clean and the grass is sparkling green. This morning the beach was very nice, tide was low and the water was nice and warm. After midday the tide started to rise little by little, a cool breeze came in through the southwest-facing window, and a huge dark cloud made an appearance, heading north-northwest. A few thunders can be heard. Lucky for us, we enjoyed the beach this morning. Tonite the sky's clear and there's no wind. Perfect for camping or sleeping under the stars. I'm still waiting for the rain and thunderstorms the local media announced this afternoon...hehe! Guess it is reciprocal with'em weather "experts". 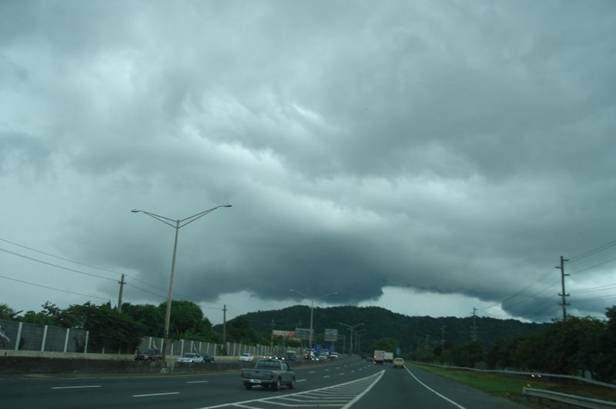 It is cloudy and dark here in the Puerto Rico metro area. Rain has been inconsisten, but the ugly cloud remains on top of us. There is no wind, the palm tree leaves are just hangin'. 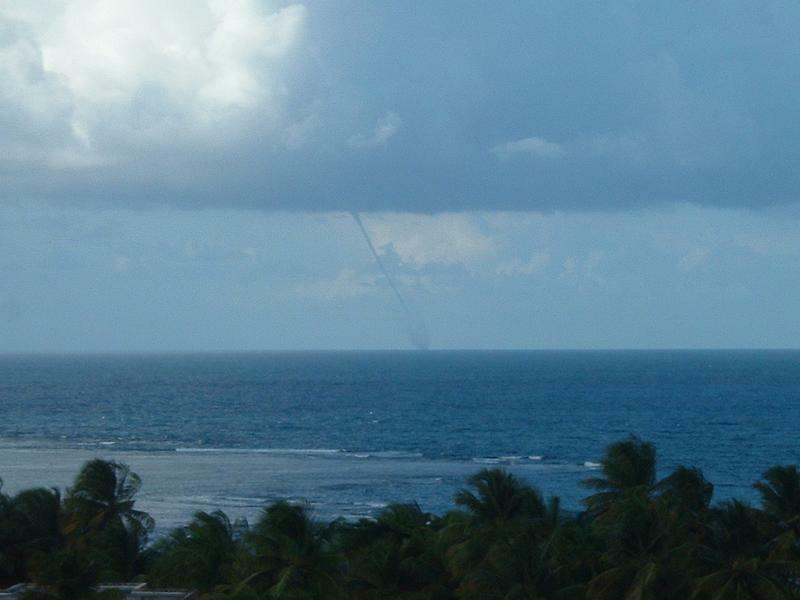 I got some photos of yesterday's water tornado near Luquillo Beach in Puerto Rico. 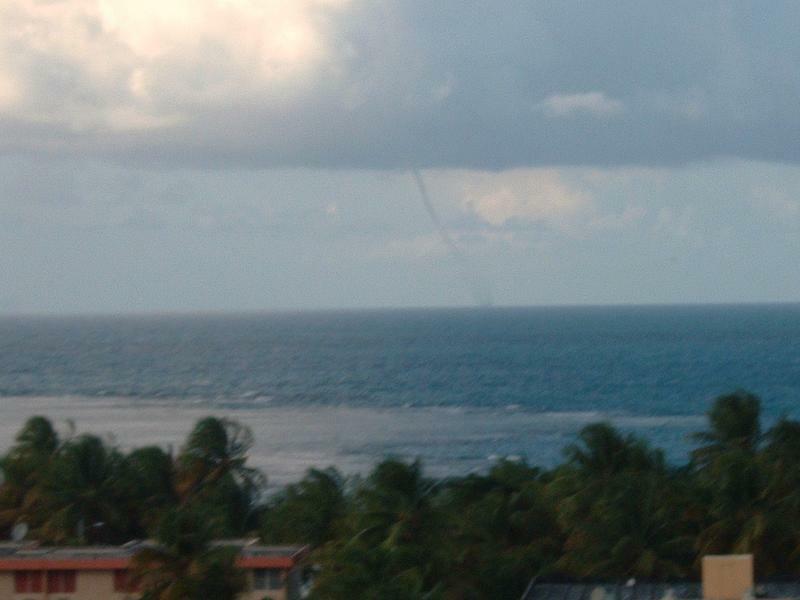 Those were taken from my condo near the beach at about 4:00pm and lated alout 15 minutes. If there is some way I can be of any help just let me know!! Super cyclonic storm Gonu is forecast to strike Oman at about 00:00 GMT on 6 June. Data supplied by the US Navy and Air Force Joint Typhoon Warning Center suggest that the point of landfall will be near 22.1 N, 60.2 E. Gonu is expected to bring 1-minute maximum sustained winds to the region of around 212 km/h (132 mph). Wind gusts in the area may be considerably higher. Today is a nice day to be at the beach. The sun's up and the beach tide is low. There's a nice easterly breeze flowing by, which is good, the day is not as hot as previous days, must be in the low 80's at this time. There are a few clouds visible, moving west pretty fast. Hopefully the rest of the day will be enjoyable.